Breakdown: There are a few big marathons that the average person on the street could list off at a moment’s notice. You know the ones I mean: New York, Chicago, Boston. World-class runs, to be sure. And then there are those marathons that the average person is probably not aware of, and may even be surprised to discover exist, but that have been mythologized in the world of the average runner to a revered status that those on the outside can hardly comprehend. 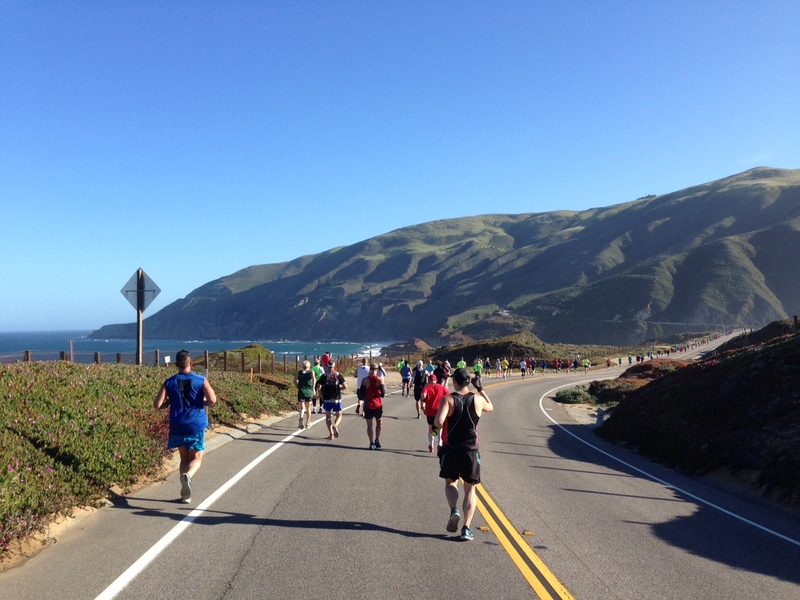 The Big Sur International Marathon, that epic Californian canter from Big Sur to Carmel along the winding, wide-open Highway 1, falls squarely in the latter category. Though it sells out just as quickly and leaves hopeful runners just as frantic for a place at the starting line, with a registration cap around a tenth the size of Chicago or New York, Big Sur, which just had its thirtieth running on Sunday, operates on an entirely different framework than these massive urban events. “Spectators are outnumbered by grazing cows and horses,” boasts the race program, and it certainly seems possible, given the complete closure of the only roadway spectators could gather on. Still, an assortment of musicians (including the iconic betuxed pianist at a grand piano near the halfway mark) provide plenty of on-course encouragement. Starting early in the morning (first buses leave at 3:30am), nearly every bus in the surrounding area is hired to shuttle runners from various pick-up points around Carmel deep into the woods of Big Sur, where runners gather for several hours, watching the sun rise in anticipation before hitting the road in three separate waves starting at 6:45am. It’s at this point that bus rides, music and closed highways are all eclipsed by the truly awesome views that runners are afforded on this course. With rolling hills on the right and roiling ocean on the left, it’s an inimitable course with inimitable views. And for those that think hills are child’s play (this Chicagoan is not among their ranks), there’s also an imitable wind constantly pushing back. Is this race beautiful? Yes. Is it worth the trip to the “ragged edge of the Western world”? Yes. Is it an easy race? Definitely not. But no marathon is “easy”—this one just kicks the difficulty up a notch. But at least you’re compensated with the kind of views you truly can write home about. And bragging rights. There’s always bragging rights. Course: I challenge you to find a more scenically impressive marathon course anywhere in the world. Starting in a makeshift base camp in Big Sur, 26.2 miles outside of Carmel, this historical course takes runners through towering trees, alongside the ocean and under the shadows of mountains before delivering them back to civilization where Highway 1 enters Carmel. The mile markers are covered with welcome encouragement and gallows humor (Mile 20 is just an image of a runner smacked against a brick wall) and the support volunteers are the nicest I’ve seen on any course. There’s a reason the race program thanks the business property owners along Highway 1 for indulging them in this six-hour road closure once a year: they’re as important a part of this race as any of the other infrastructure. Organization (gear check, etc. ): Buses leave for the starting line remarkably early but organizers make the process seamless. The gear check station at the starting line could be a bit more orderly, but there’s something fun about throwing your gear into the back of a moving truck early in the morning. Every official, volunteer and spectator had the kind of upbeat, positive attitude you hope for at a race. Goodie Bag (includes shirt): This bag essentially consists of the shirt alone—a very tastefully designed red long-sleeve running tee.